The German cockroach (Blattella germanica) is a small species of cockroach, typically about 1.1 to 1.6 cm (0.43 to 0.63 in) long. In colour it varies from tan to almost black, and it has two dark, roughly parallel, streaks on the pronotum running anteroposteriorly from behind the head to the base of the wings. Although Blattella germanica has wings, it can barely fly at all, though it may glide when disturbed. Of the few species of cockroach that are domestic pests, it probably is the most widely troublesome example. It is very closely related to the Asian cockroach, and to the casual observer the two appear nearly identical and may be mistaken for each other. However, the Asian cockroach is attracted to light and can fly rather like a moth, which the German cockroach can not. Previously thought to be a native of Europe, the German cockroach later was considered to have emerged from the region of Ethiopia in North-east Africa, but more recent evidence suggests that it actually originated in South-east Asia. Whatever the truth of the matter, the cockroach's sensitivity to cold might reflect its origin from such warm climates, and its spread as a domiciliary pest since ancient times has resulted from incidental human transport and shelter. The species now is cosmopolitan in distribution, occurring as a household pest on all continents except Antarctica, and on many major islands as well. It accordingly has been given various names in the cultures of many regions. For example, although it is widely known as the "German cockroach" in English-speaking countries, in Germany in turn, it is known as the Russian roach. German cockroaches are omnivorous scavengers. They are attracted particularly to meats, starches, sugars and fatty foods. Where there is a shortage of foodstuffs, they may eat household items such as soap, glue and toothpaste. In famine conditions they turn cannibalistic, chewing at each other's wings and legs. 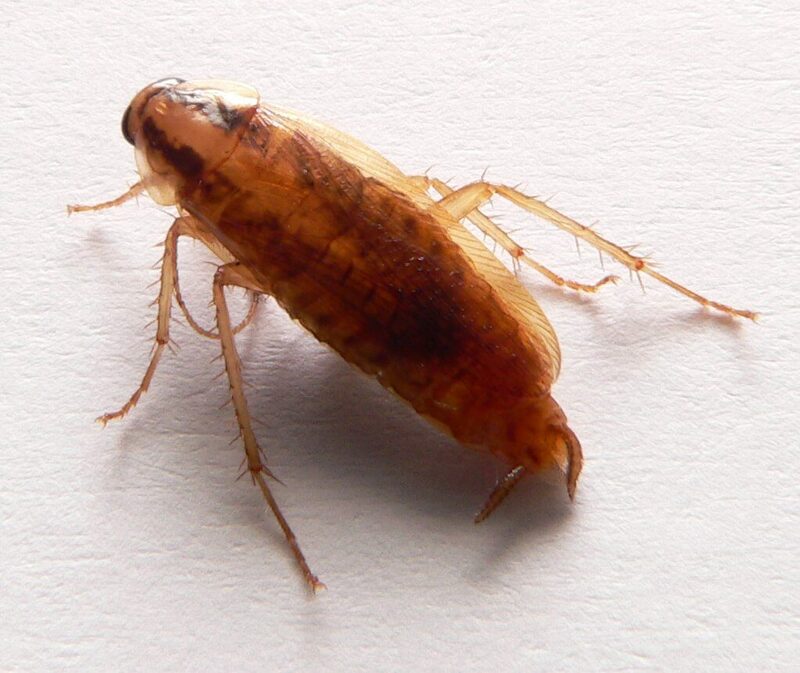 The German cockroach reproduces faster than any other residential cockroach, growing from egg to reproductive adult in approximately 123 days. Once fertilized, a female German cockroach develops an ootheca in her abdomen. The abdomen swells as her eggs develop, until the translucent tip of the ootheca begins to protrude from the end of her abdomen, and by that time the eggs inside are fully sized. The ootheca, at first translucent, soon turns white and then within a few hours it turns pink, progressively darkening until, some 48 hours later, it attains the dark red-brown of the shell of a chestnut. The ootheca has a keel-like ridge along the line where the young emerge, and curls slightly towards that edge as it completes its maturation. A small percentage of the nymphs may hatch while the ootheca is still attached to the female, but the majority emerge some 24 hours after it has detached from the female's body. The newly hatched 3mm-long black nymphs then progress through six or seven instars before becoming sexually mature, but ecdysis is such a hazardous process that nearly half the nymphs die of natural causes before reaching adulthood. Moulted skins and dead nymphs are soon eaten by living nymphs present at the time of moulting. Sexual maturity attained within several weeks, and the ability to hide in very small refuges. German cockroaches are thigmotactic, meaning that they prefer confined spaces, and they are small compared to other pest species, so they can hide within small cracks and crevices that are easy to overlook, thereby evading humans and their eradication efforts. Conversely, the seasoned pest controller is alert for cracks and crevices where it is likely to be profitable to place baits or spray surfaces. To be effective control measures must be comprehensive, sustained and systematic; survival of just a few eggs is quite enough to regenerate a nearly exterminated pest population within a few generations, and re-colonisation from surrounding populations often is very rapid too. Another problem in controlling German cockroaches is the nature of their population behaviour. Though they are not social and practise no organised maternal care, females carry oothecae of 18-50 eggs (average about 32) during incubation until just before hatching, instead of dropping them as most other species of cockroaches do. This protects the eggs from certain classes of predation. Then, after hatching, nymphs largely survive by consuming excretions and moults from adults, thereby establishing their own internal microbial populations and avoiding contact with most insecticidal surface treatments and baits. One effective control is insect growth regulators (IGRs; hydroprene, methoprene, etc), which act by preventing moulting and thus prevent maturation of the various instars. Caulking baseboards & around pipes may prevent the travel of adults from one apartment to another within a building. As an adaptive consequence of pest control by poisoned sugar baits, a strain of German cockroaches has emerged that react to glucose as distastefully bitter. They refuse to eat sweetened baits, which presents an obstacle to their control, given that baits are an economical and effective means of control. It also is a dramatic illustration of adaptive selection; in the absence of poisoned sweet baits, attraction to sugars strongly promotes growth, energy and reproduction; cockroaches that are not attracted to sugars take longer to grow and reproduce, whereas in the presence of poisoned sugared baits it is sugar avoidance that promotes reproduction.